Select sessions from the Lap of the Master program on September 7 &amp; 8 will be webcast live. Live updates of every session will also be available on twitter and the Isha blog. Four years ago, over 3000 people gathered for a residential sathsang – In the Lap of the Master – where they imbibed a cascade of grace from Sadhguru. 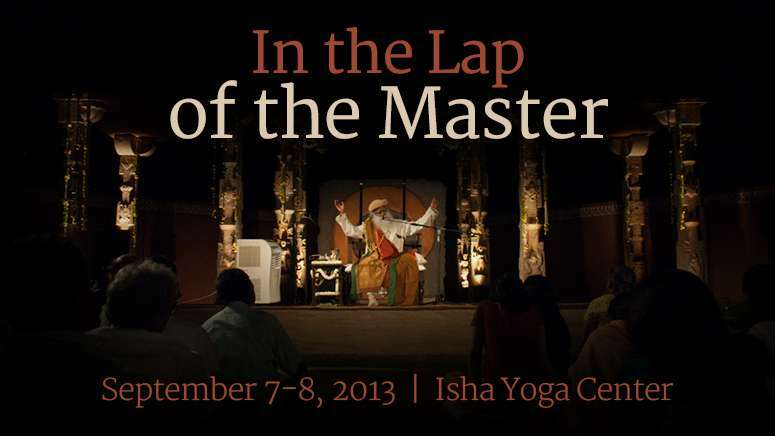 What does it mean to be in the Lap of the Master? A child enjoys the nourishment, security and comfort of the mother’s lap, which provides the basis for a joyful and effortless development. Likewise, a spiritual seeker’s growth can happen with much more ease in the presence of a Guru. Sadhguru wrote: If a plant has to flower, the soil should be right. The seed may be great, but if the soil, the temperature, the air, the water are not right, this great seed is not going to get anywhere. So creating an appropriate atmosphere for anything to happen is most important. Life happens because of ambience. Now, once again Sadhguru is conducting a special 2 – day Sathsang on September 7-8th in Adiyogi Alayam at the Isha Yoga Center. If you cannot be at the yoga center for this unique event, you can still join us for three delayed webstream sessions. *Times are in IST and may change. Due to technical difficulties, we are unable to stream the event live. Archives will be available for a limited time. Thank you very much for providing the live web stream.